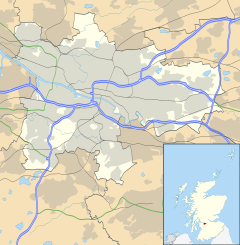 Mosspark (Scottish Gaelic: Pàirc na Mòna) is a district in the Scottish city of Glasgow. It is situated south of the River Clyde, in the southwest of the city. Mosspark and the lands of East and Mid-Henderston were incorporated into Glasgow in 1909. They covered seventy-two hectares of farmland and their acquisition was prompted by the need to develop peripheral communities to help ease the city's notorious overcrowding. The First World War was crucially important in determining Mosspark's pioneering place in Glasgow Corporation's housing programme. In 1919 ground breaking legislation made it compulsory for local authorities to implement planned housing schemes, underpinned by subsidies. As a result, Mosspark became the most ambitious of the Corporation's immediate post-war developments. The housing density and extensive green space were inspired by Raymond Unwin and the Garden city movement. The area is almost unique within the surrounding area with its tree-lined streets and boulevard stretching the length of the area at its most northern point. Entirely residential, the scheme's green and semi-rural setting was intended to provide a healthier alternative to the city's traditional tenement landscape, which had become too much identified with urban corrosion. The 1500 house development was built by the firm Mactaggart and Mickel. Although flats featured in Mosspark's plans, two-thirds of the housing stock was built in the form of cottages, semi-detached and terraced, and surrounded by gardens. The dwellings were built to high standards with spacious rooms and modern conveniences including the clean new energy source of electricity. The allocation of tenancies was predominantly to "professional" and "skilled" strata, and the area became and remained one of the most desirable for Corporation tenants. The district's exclusive character had arisen because it was generally not cost-effective for the Corporation to build such prestigious, low-density developments, especially in the depressed economic climate of the inter-war years. Mosspark was consequently a showpiece of modern planning in Glasgow, but it could not serve as a realistic blueprint for the Corporation's long-term housing strategy. Similar later housing schemes were built like Knightswood although the blueprint was changed to cheaper building materials, fireplaces were removed from the bedrooms and interior walls were no longer brick. To the North of Mosspark is Bellahouston Park and Paisley Canal railway line to the south which separates the area from Corkerhill. Oddly, the nearest train station is Corkerhill while Mosspark railway station more accurately serves South Cardonald and northern Pollok. The area has a great deal of amenities in spite of its rather small size, including a church, school, bowling club, several shops and a park directly facing the much grander Bellahouston Park. There are no public houses in Mosspark, the nearest being the Parkway Bar in Cardonald. Some outdoor portions of the sitcom Still Game were filmed in Mosspark. The TV show Vids used an empty shop in Mosspark as the storefront in the show. ^ a b "Mosspark". Gazetteer for Scotland. Retrieved 23 December 2014. ^ Miskell, Louise (2000). "Review". Construction History. Construction History Society (subscription required). 16: 115–116. JSTOR 41613822. ^ Hughes, Annmarie (2010). Gender and Political Identities in Scotland, 1919-1939. Edinburgh University Press. p. 66. ^ Pacione, Michael. Urban Geography: A Global Perspective. Routledge.